The discount is included for orders following the ones exceeding the threshold amount. 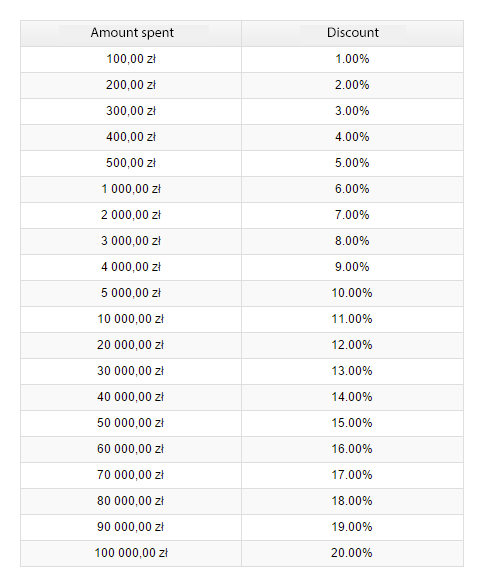 For example, if the first order exceeds the amount of 100 PLN, the next order will be calculated with a discount of 1% until total value of the products you have purchased exceeds 200 PLN - then subsequent orders will be calculated with a discount of 2% and this way up to maximum discount of 20%. Shipping cost is not counted for treshold amount spent.